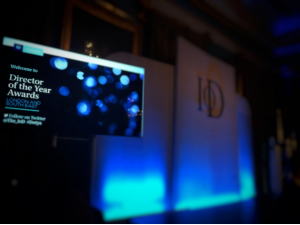 Last night saw the IOD Director of the Year Awards London and South East hosted at the IOD headquarters in Pall Mall, and our very own Lee and Mersudin went to enjoy the festivities on behalf of Sleeping Giant Media. The Institute of Directors has been supporting businesses, and those who run them, for the past 114 years, and is the UK’s longest running organisation for professional leaders. They help to support and encourage leaders, and promote the very best business practices to benefit the businesses community. Mersudin and Lee headed up to London to attend the event, enjoying what they described as a fantastic evening with an electric atmosphere. The wine was flowing freely amongst the guests as they excitingly awaited the announcement of the winners – and with such stiff competition, it was sure to be interesting! Declan Curry was the ceremonies host, who managed to be super entertaining as well as asking some insightful and interesting questions to the winners – particularly surrounding how entrepreneurs are handling the current climate. Their answers were varied, but extremely interesting to listen to and learn from. There were a total of 480 amazing companies vying for this year’s awards, and Luke our CEO was nominated for Director of the Year (Small Company) – along with ten other worthy nominees, including James Dempster from Cobb Digital and Andrew Hookway from Extech. 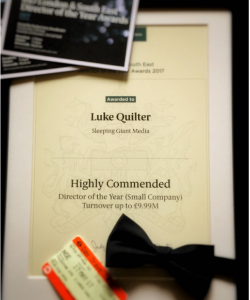 Although Luke unfortunately didn’t win the award, he did however receive a Highly Commended certificate for the Director of the Year (Small Company) category from the IOD, which he is over the moon with. Thanks to all involved for a great evening!